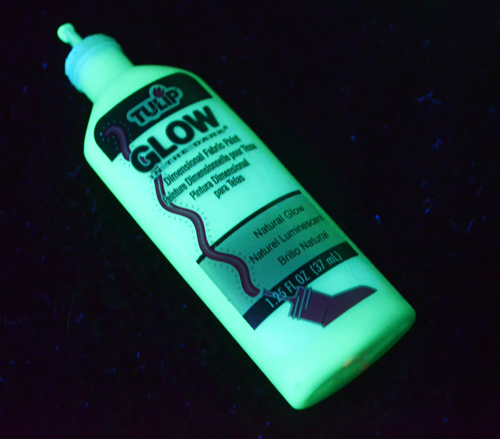 I have always been one part in love with glow in the dark and one part scared of it. The scared part comes from childhood whenever I had a glow-in-the-dark object in my room. When I went to sleep at night, I’d always have to turn the other way cause the glow object creeped me out and kept me up at night. Luckily, I’ve grown out of those feelings. LOL. I now know the glow object can not come after me or haunt me by looking at it. Also, another factor as to why I love glow is because my fiancé William LOVES it. He has all kinds of cool glow stuff, blacklights, powders, paints, etc. He recently even made glow rocks for his fish tank, which are pretty awesome! They don’t hold a blacklight to my glow-in-the-dark ornaments (sorry honey) though. Anyway, I digress. 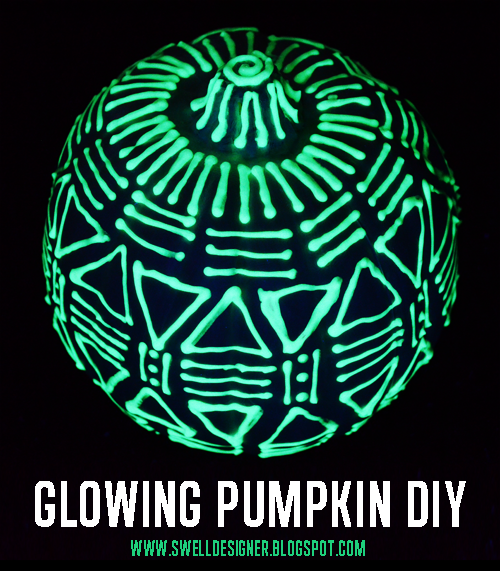 Here’s how you make your own glow pumpkin sure to haunt you all Halloween long!!! P.S. 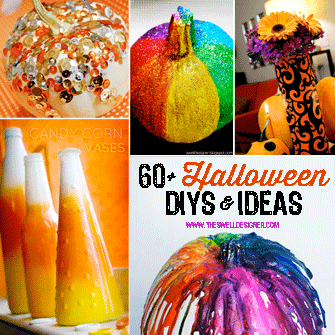 If you like this post, you’ll love my DIY Halloween page called Easy Pumpkin Ideas where you’ll find 10+ project DIYs! Check ’em out! 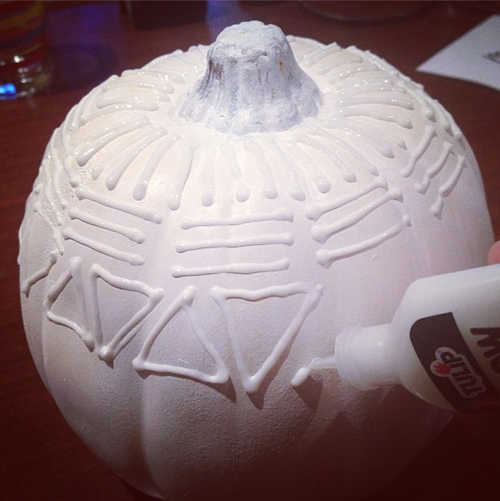 Start off by basecoating your white pumpkin with an even brighter white acrylic paint. 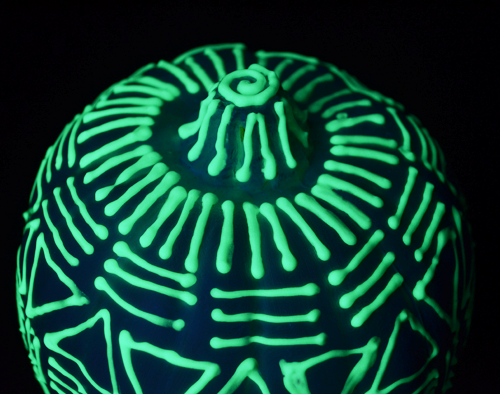 Again, the brighter white your pumpkin is, the more luminescent it will be when charged! 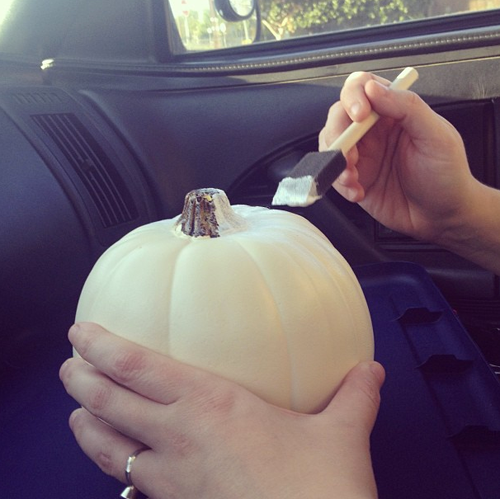 Please note, I basecoated this pumpkin while riding in the car. Pumpkin crafting does not stop just because I have things to do and places to go. 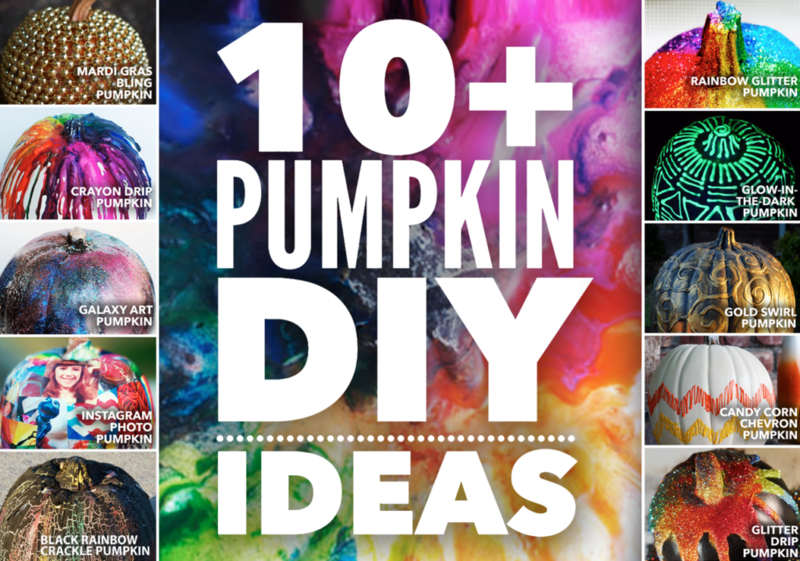 Next, break open your Tulip paint and go to town with a fun design. I randomly doodled on mine, but you can really do anything under the sun…or should I say “Under the dark”?? That’s it. 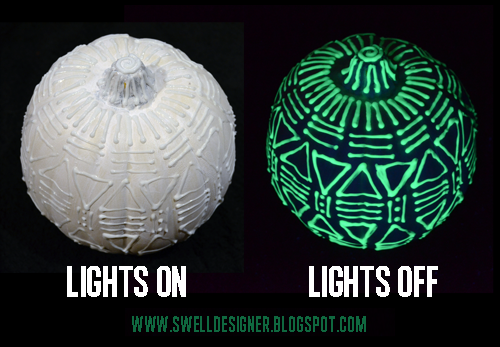 Here’s a fun little comparison of what the glow pumpkin looks like when the lights are on and when the lights are off. Note, I charged my pumpkin to full potential using a blacklight for the lights off photo. The charge will last several minutes. Simply hit it with a bright light or black light to charge it up again. Here’s a close up detail of the doodles. Mine line work isn’t perfect, but I still think it turned out cute. I love the swirl on the stem top!! I’ll try to add a nice pic of it during daylight hours tomorrow. I’m a night owl, so it’s hard to get nice pics at nice that don’t look all yellow! So do you like Glow-in-the-Dark??? 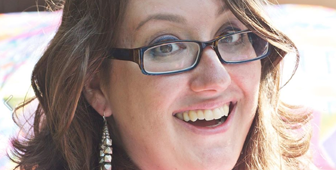 I’d love to know your thoughts!